A man going into battle made a vow to God: “Let me win this battle, and when I return home victorious, whatever comes out of the door of my house I will give as an offering to You.” God gave him victory in the battle, and he returned home. Who should appear at his front door, but his only daughter, playing music and dancing to celebrate his homecoming? The man informed his daughter of the vow, saying, “I have given my word to the Lord, and I cannot go back on it.” Stoically, she accepted this news, and asked only that she have two months to spend with her friends and mourn her fate. Was God happy about his actions? Does He sanction child sacrifice? What kind of God would do that? Are we supposed to imitate this myopic dedication to God? These questions arise because we tend to read the Bible prescriptively rather than descriptively. In other words, we think that Bible stories are meant to impart moral lessons, and just because someone’s in the Bible, we should follow their example. However, we are hard-pressed to find any human in the Bible who set a consistently good example. Noah got drunk. Jacob lied to his father. David committed adultery and murder. The only consistently good, heroic character in the Bible is God! For the most part, stories such as the one above are not condoning behavior, just describing it. There are some sections of the Bible which clearly do contain ethical teaching, such as Proverbs, the Sermon on the Mount, and Paul’s letters. However, reading descriptively rather than prescriptively helps alleviate many interpretive problems, especially when reading Old Testament narratives. Another method that helps interpret these difficult passages is taking the whole of Scripture into account. In Jeremiah and Ezekiel, God speaks out strongly against child sacrifice and even punishes people harshly for sacrificing their children. He is as appalled as we are, if not more so, and says, “I did not ask you to do that, nor would such a thing even come into my mind!” (Jeremiah 19:5-paraphrase). Both Jesus and James caution believers against making any vows, but rather “let your yes be yes and no be no.” Jephthah’s actions would probably not be commended by God, nor should they be imitated by us; rather, it seems to be the pattern of the book of Judges to demonstrate the inadequacy of Israel’s human leaders and point to the need for a divine Shepherd King. 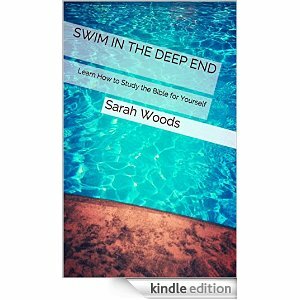 In my book, Swim in the Deep End, I challenged people to get deeper with their Bible study. Inevitably this leads to passages which are shocking, disturbing, and difficult to apply; however, following the above suggestions can help make it easier.